No fewer than two thousand Nigerian youths yesterday commenced leadership training in the areas of business, economy and mentoring in 14 cities in different states simultaneously across the country. 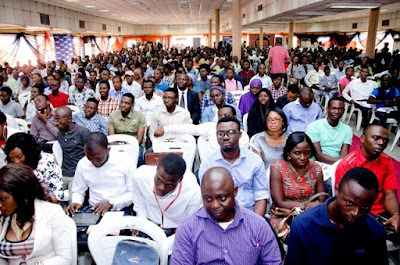 The number is made up of about 200 selected youths each from the different 14 states that were drawn from various institutions of learning and networking groups through an online application. The nationwide mentorship and networking training tagged ‘The Impact Project’ (TIP) is facilitated by the Mandela Washington Fellowship Alumni Association of Nigeria (MWFAAN) with the funding from American government to ensure the mentoring, leadership and interaction opportunities offered the alumni members by the American Government were transmitted to more youths across the country. The Association currently has about 285 alumni members across the country. Speaking at the Ibadan School of Government and Public Policy, Bodija, Ibadan, venue of the Ibadan training, President of the Association, Segun Fatudimu, a dental surgeon and leadership coach said the effort was to inspire the youths towards going into politics, run their own business and start their own organization as a way of discouraging them from waiting on the government for virtually everything. He said, the event tagged - The Impact Project (TIP) - is to ensure that the impact received from the American funded fellowship programme was transmitted to other burden youths in order to create a new generational order, pointing out that, it is a follow up to an earlier one tagged beyond leadership programme called ‘Beyond school campaign’ which was aimed at helping teenagers build their own leadership and entrepreneurial skills. He said, “We are training about 2000 youth leaders so that they can multiply the effort. We want to inspire them towards going for politics, run their own business and start their own organisation. They should not wait for the government again. Nobody will give us power as young people, we need to take it and the best way to take it is what I call the Impact Driven Visibility. We have to be powerful, we will not beg for power. We need to be begged to come and take power when we are known to have already gain grounds and how to gain grounds is to go in small units and in different places across the country, to bring young people together and empower them. Another alumni Timi Olagunju in his remarks advocated for a kind of situation that allows both the youths and old to collaborate in building a progressive Nigeria, saying, “what we need is generational co-mingling, in a way that the young people can come with innovation and energy while the old people come with experience. If young people with innovation and energy work with old people with experience then we can build a nation that works for everybody. But what we have today is, much older people taking the place of power. We need generational co-mingling not necessarily generational shift.